The question of employee productivity has always been a major concern for any company that is trying to evolve and grow. And indeed, productivity is closely tied with the income rate. Perhaps, every business at some point of their existence has questioned how to increase the productivity of their customer service staff without wearing people out and increasing their stress. It is obvious that stressed out employees’ performance would inevitably lead to decreased customer satisfaction and damaged company image. Organizing the company structure in a way, which would inspire people to work more efficiently and without exhaustion is not an easy task. At the same time, it is a true inspiration to see both your employees and customers happy. In this regard, we would like to share with you a few tips, which our company has been employing and from which we received very positive and encouraging results. We hope you will find them useful. Bureaucracy brings so many negative effects to companies, and most importantly, it leaves customers immensely frustrated. Simpler procedures will lead to shorter interactions and more efficient help to your clients. However, here the point is not only to remove unnecessary procedures, but also teach your agents a simpler approach to every customer’s problem. Recently one of our clients shared with me an interesting observation: “Whenever I approach a customer service person, they always think my problem is much bigger than it is. They start giving very complicated solutions or asking too many questions. In reality, in 99% of cases the problem is very basic and I need only basic help with it”. Indeed, if customer service agents were trained to look simpler at each service request, company-client communication would be much more effective and more psychologically rewarding for both parties. Proper etiquette helps to make interactions clear, simple, polite and thus reduce the time necessary for solving a problem. Also, professional language will establish trust in your company and your employees. Customers will be able to rely on your service in conducting their business and this will earn you more long-term and loyal clients. Even the best training programs at which the database of the CSR’s brain is loaded with lots of rules and how to’s are bound to fail without trust in the person’s ability to discriminate and giving them the necessary freedom to do that. Even though statistically about 80% of the customer service problems are repeating issues, solutions to which are already known, the amount of the new situations which CSRs are bound to face every day is very considerable. Depending on how effectively they are solved your company may keep or lose 20% of their customers. As long as new situations and issues don’t have a ready-made answer, it is very important that the agents feel competent and confident to use their own judgement and skills to find a solution to these problems and present it to the client. Empowered agents also are the ones who are fit to become your brand ambassadors and get involved with creating and spreading a good image of your company. Too often the course of a customer service interaction is affected by personal things – the agent’s mood, the customer’s mood. While we cannot influence the customer, we can train our agents to approach every customer individually while remaining impersonal inside. It is a common situation, especially with new CSRs, that the quality of care they give to different customers is uneven. And it is true that sometimes a customer approaches customer service very positively, friendly and the agent is inspired to give them better care and more personal service than he/she gives to others. While in other cases, when one has to deal with a difficult, frustrated or simply disrespectful client, the agent is affected by the customer’s mood and fails to give as good service to those clients. A professional approach implies that the agent does only what is necessary. Treating every client equally, when the agent is not affected not only by the negativity of the difficult clients, but is also by the client’s exuberant excitement, can create miracles in building strong relationships with clients. Unfortunately, practice has seen many cases when a relationship with a customer was damaged equally strong by under treatment of frustrated customers and too personal treatment of well disposed clients. That’s why for the best performance it is very important to maintain the right balance between professionalism and personal approach. “Do what is necessary” is one way of remembering where the separation line is. Well trained, knowledgeable and responsible agents cannot give their best performance without efficient customer service tools. 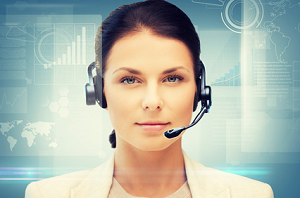 In customer support, the speed of response is crucial to customer satisfaction. If, for example, the CSR does not have quick access to the customer’s information, such as the details passed to the operator application in real time in chat support, he/she will not be able to provide quick assistance to the client. If due to lack of such features in their tools the agents will have to ask the customer the information which he already provided to the company, this will only increase the client’s frustration and dissatisfaction with the service. Share jokes and funny stories. Happy employees truly mean happy customers. Hire a manager who has the right attitude, who is a fun and who will lift the team spirit. Remove the pressure of deadlines and results. Make your employees forget their personal problems when they come to work. Let them feel that work is pleasure, as it is indeed a pleasure to serve people, help them to solve their problems and make them happy. The more fun your team has, the better results will come automatically. This is closely connected to the previous point. The more people are involved into the life of a team, the more relaxed and easy they are and this enables them for better performance without creating stress in them. Giving support to each other, sharing experience and positive attitude makes work easy and customers will inevitably get this vibe. The good atmosphere and positive emotions from dealing with your support will keep customers coming back. The last but not the least. In my opinion this simple thing can make miracles. Due to social conditioning, which is firmly established in people’s minds, employees and their positions are viewed unequally, as more or less important. People’s work is given different degrees of respect. Social ladders sometimes create walls between company workers and then strategies are being developed to break those walls. It’s much easier not to build any walls in the first place, saves time and effort, rather than invest resources in breaking those walls after. Companies should learn to treat all their members equally and with respect. If this environment is dominant in your office, you can be sure your employees will always be productive and your customers happy. What tips do you have to share with our readers? Has your company been using any other tactics to boost agents’ productivity? We welcome any of your feedback and ideas in the comments. This entry was posted in Articles, Best Practice, Tips and Tricks and tagged customer service productivity, increasing productivity of customer support, productivity tips for customer service. Bookmark the permalink. Are You Fit for a Customer Service Job? Giving your employees as many resources as possible to efficiently do their jobs is going to go a long way. It give them a chance to solve problems on their own and help the customer more easily and quickly. Thank you, Drew. I agree with you. Empowering agents with versatile and efficient tools is important. It is in direct correlation with the level of customer satisfaction. This is a nice read from a manager’s point of view. As a manager, it is difficult to handle multiple tasks especially when deadlines are drawing close. I realized early that if I was to succeed, I had to learn to take advantage of technology. That is why as an advocate for continuous learning and upskilling in the workplace, I have made it a point to have all of our employees, including myself, take on online courses designed to improve computer literacy and efficiency methods in the company like that provided by Career Academy http://bit.ly/2f9m48l. I have it integrated into their career plan so that they can better make use of resources for them to increase productivity and efficiency while working. Adding these tips would augment whatever current training we have for them. Thank you for your insight, Nino. I agree that computer skills are very important in becoming efficient in a customer service job. Awesome content and customers is our asset and we have to find some ways to make them happy. If someone maintain that rolethat means he/she is the goodwill ambassador of a company. These tips are looks very effective and will try to follow.